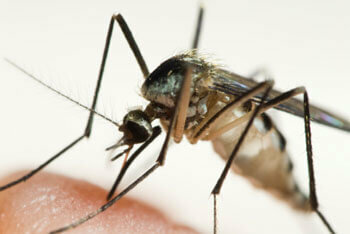 Mosquito | Massey Services, Inc.
(Length: 1/8″ to 3/4″) Mosquitoes are insects that are found throughout the world. They are most commonly known for carrying diseases such as West Nile Virus (which can lead to Encephalitis), Malaria and Yellow Fever. Adult mosquitoes frequently rest in grass, shrubbery and other foliage, but they never develop there. Mosquitoes lay their eggs directly into standing water which can be anywhere from lakes to bird baths, tin cans and other water-holding containers. Once the summer rains cover these eggs, they hatch into a larvae, then develop into adults within a few days. Female mosquitoes are the ones that bite, male mosquitoes do not. It is important that homeowners remove sources of standing water around their homes to minimize breeding of mosquitoes.